A 10-kilogram, metre-long mackerel had launched itself from the ocean, at a height of more than a metre and a half, and cut her throat. “It sure had some momentum. It just knocked me off my feet. [I] didn’t see it coming, didn’t see a thing,” Mrs Bingham said. 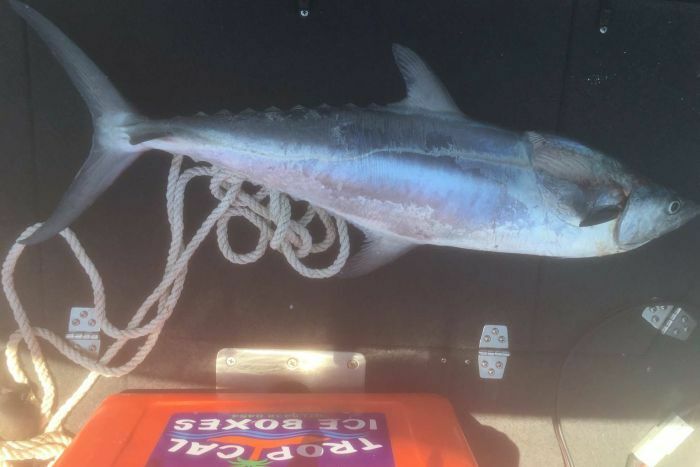 On Monday last week the pair had been fishing near the ConocoPhillips pipeline off Channel Island boat ramp, about 45 kilometres from Darwin in the Northern Territory. Mr Bingham said the blood from his wife’s wound soaked through his shirt in seconds. “Neither of us had a line in the water at the time. I was putting bait on so my back was towards Belinda,” he said. “Next thing she’s on the floor at my feet going ‘Something’s hit me, something’s hit me’. Looked up, she had her hand to her throat. “You could see the blood coming out through her fingers, pumping. He quickly called triple zero, and the police and ambulance had arrived by the time they had reached the boat ramp. 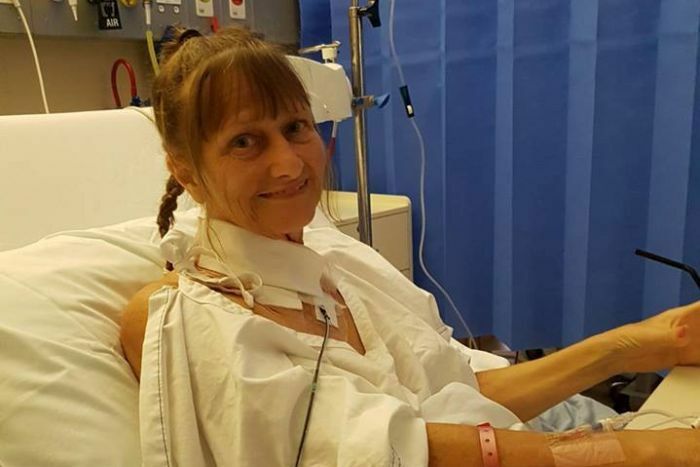 After recovering in Royal Darwin Hospital, Mrs and Mr Bingham spoke to ABC’s Tales from the Tinny. 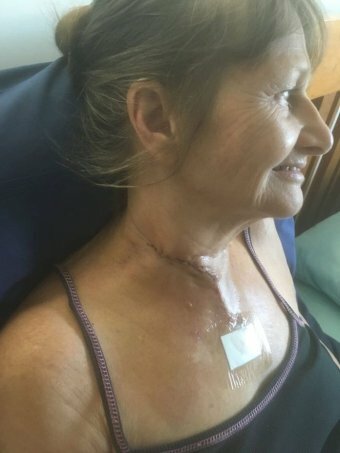 Mrs Bingham was left with a deep wound to her neck, which she said nearly reached her thyroid. 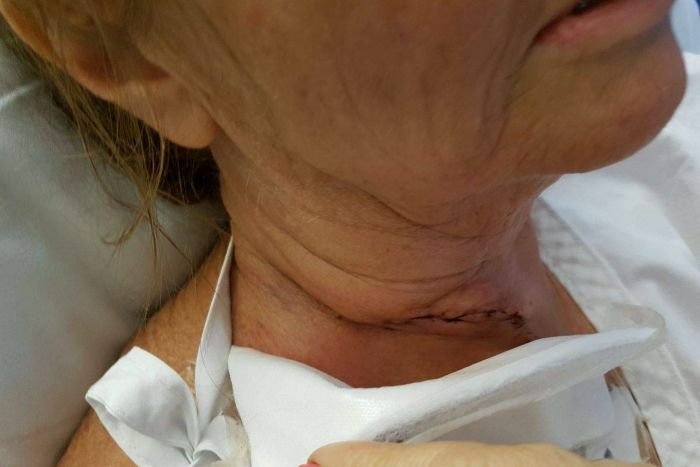 “Other than that it’s the chest pain and my voice, because the fish bashed my throat,” she said. “And they have been worried about the voice coming back. She was relieved the mackerel had died when it struck her and fell lifeless into the boat. Otherwise, she thought it would have cut her more. Asked if they then went on to eat the fish, Mr Bingham said they had decided against it as it had been too long by the time they got his wife to hospital. “The main thing is she’s still here to tell her story,” he said. St John Ambulance NT operations manager Craig Garraway said the woman could have ended up “a lot worse off”. “I believe from the paramedics report there, it had actually impacted on a number of major vessels within the throat area,” he said. He said the couple did well to stem the bleeding as they made their way back to the boat ramp. While Mrs Bingham’s injury was “an unusual story”, Mr Garraway said he had seen fish leaping through the air during his own fishing trips. “I’ve been lucky the rogue fish have [only] been flying past me,” he told the ABC.